With the weather changing every couple of hours and autumn being just around the corner it's the perfect weather for layers. You can peel off a few when the sun shows his face and pile on a few when a bunch of dark clouds are passing by. Today I also piled up on bags. One for things that I need to take out often; my sunglasses, public transport pass and my phone. The other for the things that would usually be on the bottom of my purse; a book, some cosmetics, my wallet and keys. Wearing several bags at the same time isn't a burden at all, it's actually very practical to keep your stuff separated and it looks cool in a nomadic way. Check this post out about wearing multiple bags by Susie Bubble. Interesting idea you and Susie have about doubling up on bags. I often am stuck having to carry a wide bag and at times that is just impractical. Your hair is fading to a light blonde, I kind of like it, I was wondering, are you planning on dying it back to a silver hue? Or do you feel it's time for something different now? I love it! You look beautiful! I really like the last picture! Wauw! Lijkt me alleen best onpraktisch, twee tassen? Then again, veel opbergruimte. Leuk om je een keer lachend op de foto te zien! great post, love the gif! you are absolutely stunning. wat leuk weer hoe je over die tassen denkt! i love layering! you look flawless as always. i'm so jealous of your effortless ways of styling clothes and looking great in whatever you put on! lovely look! Mooie outfit & zeer leuk tasje! Oh, I love this idea of wearing two different bags to seperate some things from the others. I often do it, but most of the time it's a small bag + tote combo. I've got a feeling that it might be a really big trend soon. You look amazing! I really feel like doing some layering now. Such a chic, all-black attire transformed by totally rad layering. And the DIY furry purse- instant love. Your style seems a little Lykke Li which is amazing!! I love GIF pictures! I use it a lot :-) and your outfit is awesome! Your totally right about the layers for this season. Good tip! Layering these casual pieces together really gives them such a chic, polished new look! Love it. 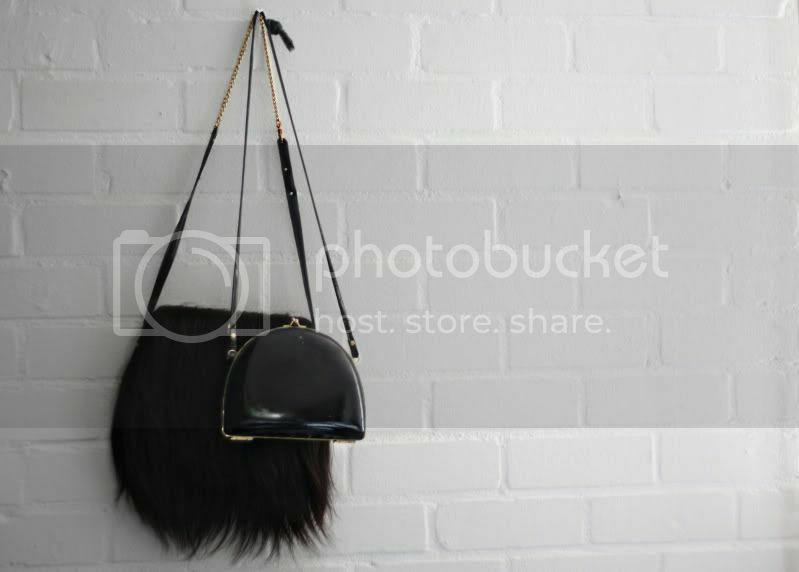 And that thrifted black purse if amazing. Coincidentally I was planning on painting my hair again today! Normally I would add some color every week but decided to give my hair a bit of a rest as it is very very damaged. cute GIF! i love your blog and your style, really inspirational! Die tassen zijn echt heel tof! it's true, the thing about layering! you know, taking thing off and b´putting back on, such a good idea! the multiple bags-thing is quite a funny but smart idea! I'm just lovin' the double bag look! we saw that post on Susie's and think that she's SOOOOO right!!! It's just looks fab and will make it easy to hold EVERYTHING heavy we carry around! That DIY hairy bag is the BESSSST! AMAZING! & I love it how you made it into a gif. i love when you layer, it's just basics pieces but it looks so interesting together! Love your outfit. And cool DIY project. The bags look great together and nice work with the layering. I looove the patent bag so much, I've been on a hunt for a smaller bag (I'm so sick of wearing my backpack EVERYWHERE) and I still haven't been succesful. I wish I found one that nice. And both of those bags are just amazing, I love the idea of wearing them together. Het is een goed, beter, best plaatje. Je tweedehands tasje is mooi! great post, love the gift! you are absolutely stunning. great idea! Don't know if someone already asked this question, but the transparent long-sleeved shirt, where did you buy it?